We had a very late breakfast and surprisingly were the only ones there. Mary, one of the waitresses took pity on us and talked to us in halting English to the point where it got slightly annoying. Eventually she got on with her tasks and we finished our meal and returned to our room to finish packing. 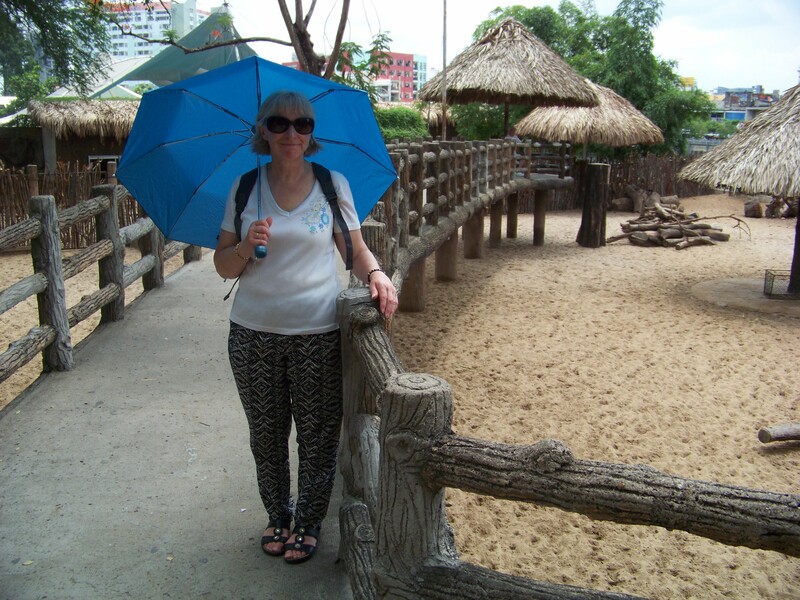 We had planned on a walk to Saigon Zoo and despite the withering humidity it only took around 15 minutes to walk the short distance there. Pretty soon after checking out the giraffes and rhinos we stopped for cooling ice creams and then after ogling several more species we stopped at length for ice filled drinks, before completing our circumnavigation of the site. It is a Zoo of the old style, cramped quarters for the animals and a seeming lack of understanding of animal welfare. 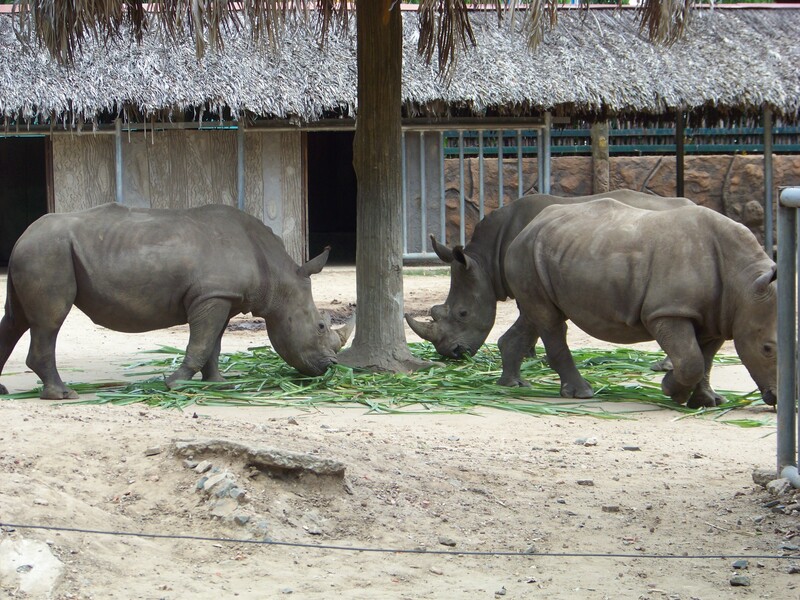 As in the UK, the zoo was also playing host to many school parties, though that is where the comparison ends. There appeared to be no one in charge, we couldn’t spot any teachers. 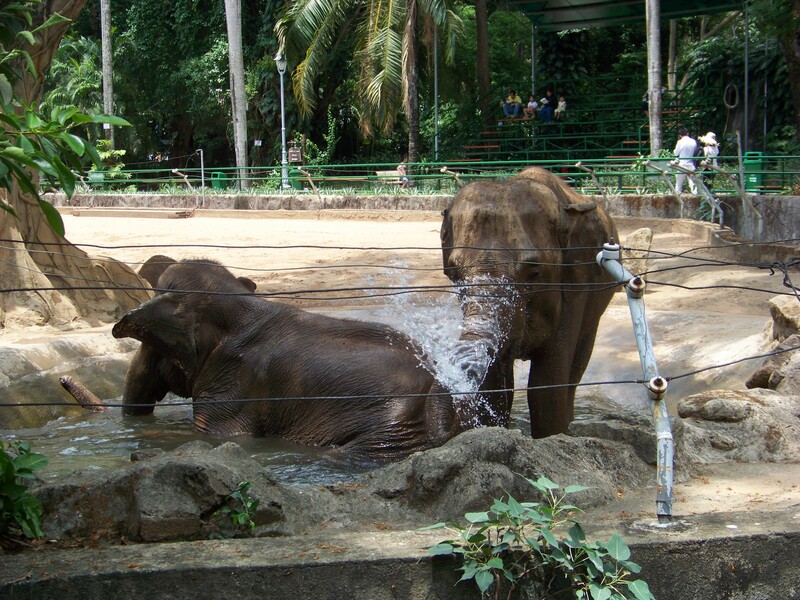 There was no structure to their activities and no apparent learning going on, other than finding out that if you squirt water at the animals they react. We returned to the hotel to check out by 2pm. We settled the bill and then had our luggage put into storage for our flight that night. We met Ron and Jenny who informed us that the airline wanted us at the airport for 10pm, as this was the time of our pick-up we got Reception to contact the transfer company and change our time to 9pm. Afterwards we then set off on a slightly longer walk to the Reunification Palace. It didn’t appear to be quite as humid and the journey there was slightly more pleasant. 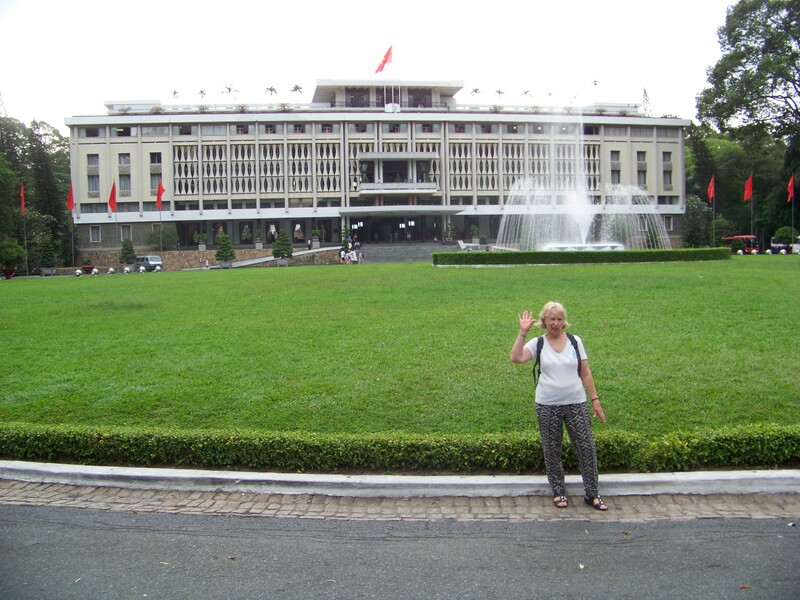 The palace is where the Vietnamese President surrendered to the Vietcong after the Americans pulled out and refused to support his regime anymore. We remembered from newsreels at the time the helicopters leaving the roof of the palace as they were fired upon. 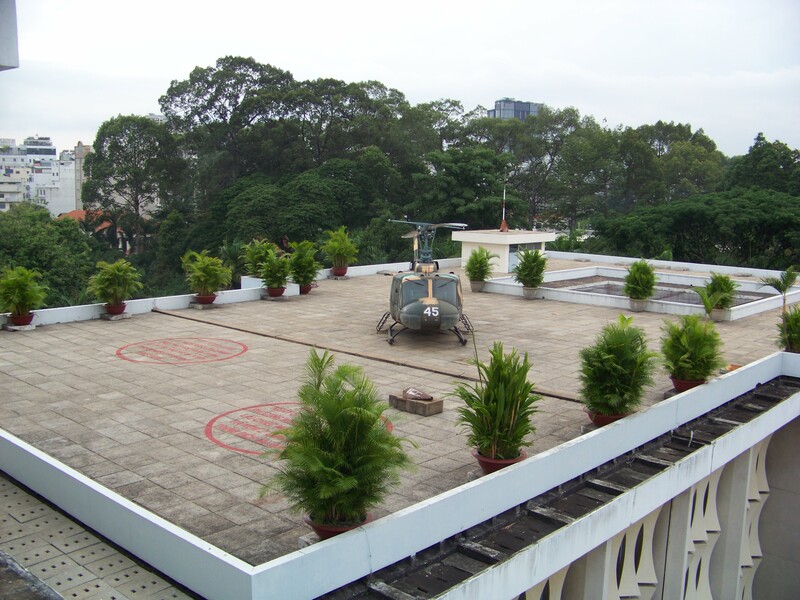 Not surprisingly to mark this event, today they had a Huey parked in the same spot on the roof. We had a look in all the state rooms, thoughtfully renovated to how they were in the 70’s. 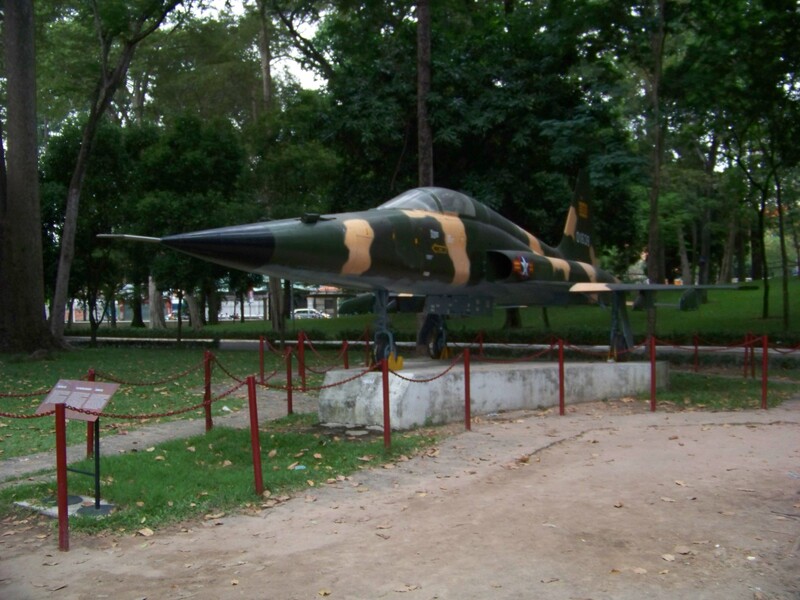 A North Vietnamese pilot had infiltrated the South Vietnamese Airforce and flew one of the American’s F4e fighter planes and bombed the palace, hence the need for the renovation. Again, thoughtfully that plane now sits in the gardens alongside the palace. 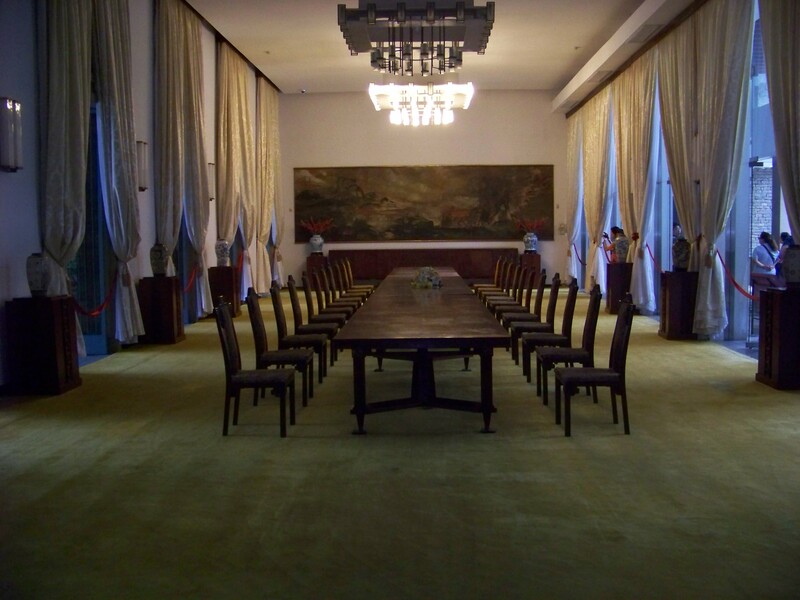 We descended into the bowls of the palace to experience the ‘Bunker’, this is where the Americans directed the war effort and the Vietnamese President stayed during the finals stages of the war. 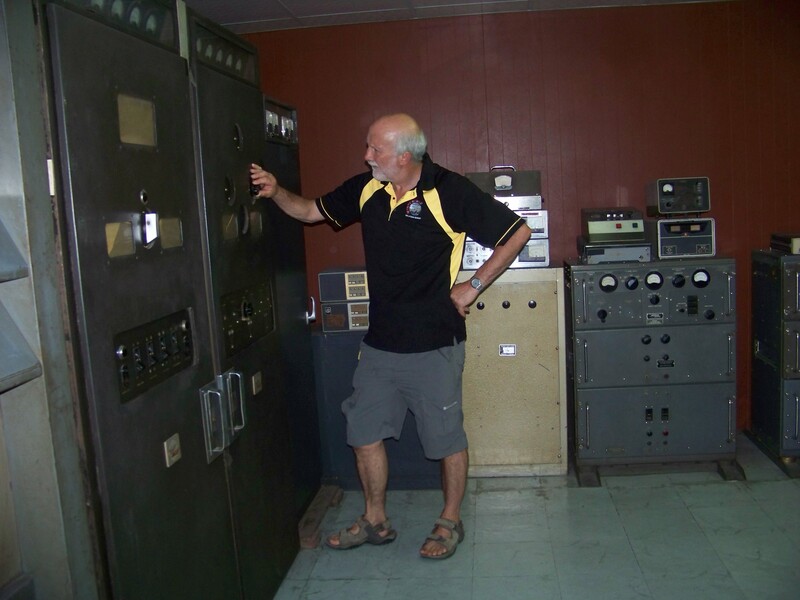 It was still packed with 1970’s Hit-tech equipment, how dated it seemed now. The building is occasionally used for ‘Party’ functions but no longer for state business, though I think I read that you could get married there. On our return to the hotel we attempted to visit the Cathedral but it was after 4pm and it was closed to tourists. No doubt if the Pope had been holidaying they may have made an exception. Across the road was the post office, they did let people in after 4pm, so we entered. A beautiful building, looking freshly painted and still operating as a central post office. We witnessed people posting parcels, buying stamps and collecting and filling in all sorts of government forms. Yes, it was nearly exciting. We found a Thai restaurant called Tuctuc to eat. As expected the food was very good and while waiting for the meal to arrive we Skyped Sarah. She was taking Mia for a walk at the time so we rang back 5 minutes later when she had got home and had a chat. It is her birthday tomorrow and she was putting on a BBQ for the family, luckily Sue and I are presently accustomed to eating out. Arriving back at the hotel we visited the toilets then set off to visit the harbour just down the street. It was now dark and crossing the very busy roads was extremely hazardous. You need 360 vision at all times and also remember that standing on the pavement does not make you safe from mopeds. 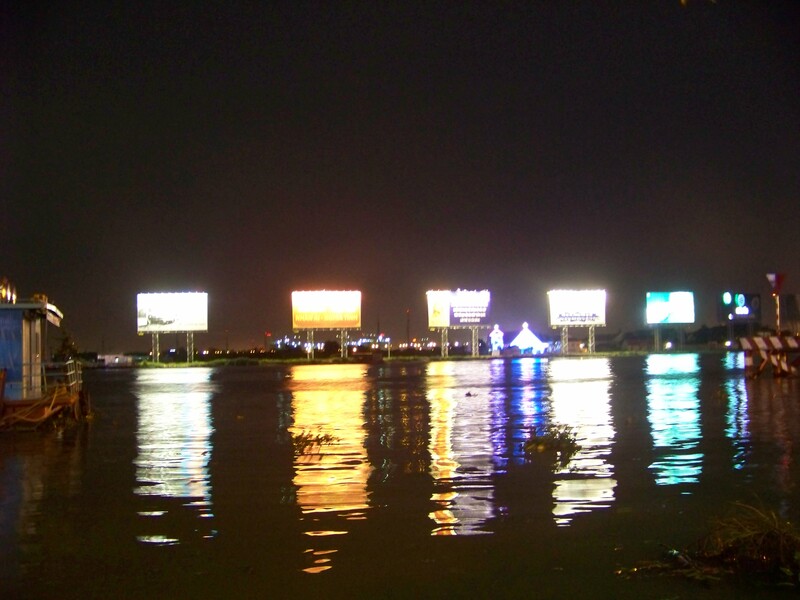 When (with difficulty) we did manage to reach the river bank we joined the many other romantic couples sat on the benches that lined the promenade and watched the lights of boats pass by and the occasional fish jump as if to say hello. We switched benches a couple of times to enjoy the view then set off back to the hotel. Arriving rather weary, we got our luggage out of storage, found the room we had been given to have a shower and sorted ourselves out for the journey home. Sue had been previously complaining that her legs were itching and when she inspected them they were quite blotchy and she had what appeared to be a small bite mark on her thigh. While we waited for our transfer to the airport we sat in the bar and had drinks. The driver arrived at 8.45pm and we were off. Though the airport concourse seemed packed; we had checked in, passed through immigration and were sat in our departure lounge pretty quickly. They were showing Iron Man 3 on the screen near the gate and we watched this in its entirety. I had another look at Sue’s ankles and the blotchiness had got profoundly red, they didn’t look very good. The flight left 10 minutes late on a 12 hour 40 minute flight. We both managed to get some sleep on the flight but I found it difficult to get comfortable, though we did have a spare seat between us.Passport control and baggage collection went without a hitch and though we just missed the Hotel Hoppa Bus by seconds and had a 30 minute wait for the next, we soon had our luggage in the boot of the Fiesta and were pounding the tarmac of the M25 on the journey home. Jamie was in the garage working on his car when we arrived and was pleased to see us back. Checking Sue’s legs there had been no improvement so after a coffee I took her to the Cottage Hospital to get them checked out. Unfortunately, it being a Bank Holiday weekend there was only nurses on duty and the one we saw wanted a doctor to check Sue out, We decided on the Leicester Royal as Sarah was having a family BBQ to celebrate her birthday and she lives just 10 minutes away from the Royal. We set off after Sue had hung the washing on the line that she had thrown into the washing machine within minutes of arriving home. I dropped her off outside Accident and Emergency and then continued on to Sarah’s. I had to wait n the car for half an hour as they were returning from Bradgate Park. While the Rothwells and Jamie arrived and the BBQ was prepared I kept checking on what was happening with Sue. She was there for three hours before I got a text to pick her up. They were unsure as to what she had got, but the blood and urine tests were clear and whatever it was, wasn’t infectious. They even tested for Malaria. She has to see her own GP on Tuesday, but to ring the hospital if a fever develops. 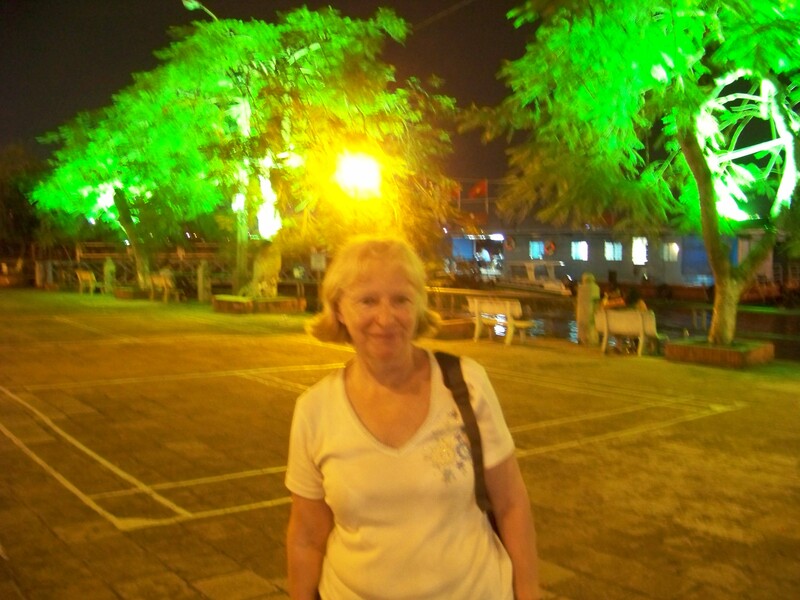 We both think it is a heat rash, as yesterday was extremely hot and humid and we did a lot of walking during the day. Fingers crossed we are right. 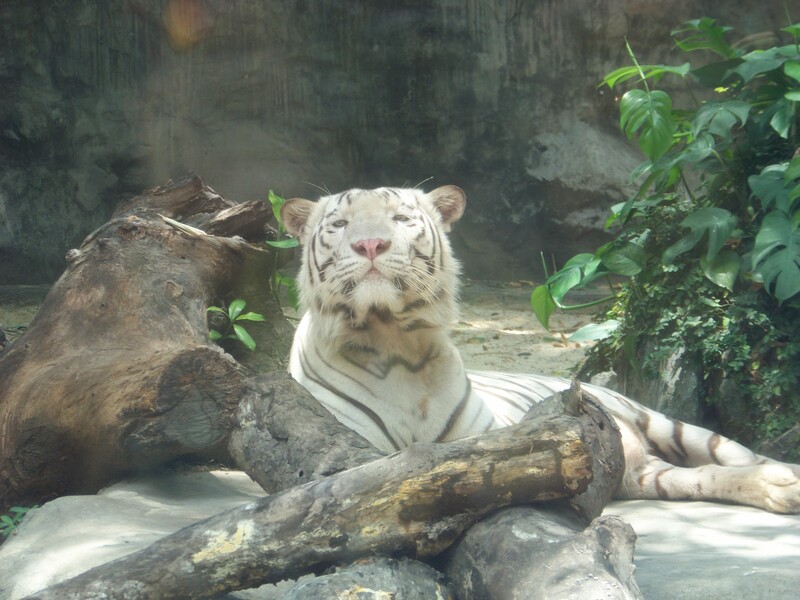 This entry was posted on May 23, 2015 at 9:01 pm and is filed under Uncategorized. You can follow any responses to this entry through the RSS 2.0 feed. You can leave a response, or trackback from your own site.